A warrior slashes away at a goblin killing it, only to have 3 more replace it. Frustrated and surrounded, the warrior unleashes the burning hands spell upon them, killing them all. Arcane warriors are those who specialize in spellcasting and melee combat, trying to make the of most out of both options. 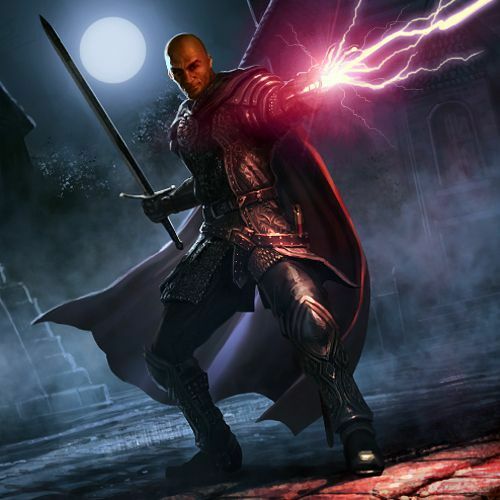 While this dual specialization may hinder them compared to others who solely focus on spellcasting or martial prowess, arcane warriors make up for it in their versatility in and out of combat. How did you obtain your magical powers? Did you already have magical powers, or did you obtain them through some other means such as being granted powers from a powerful being, born in a plane filled with strange magic, or something else? What are your goals and why are you adventuring? You can make an arcane warrior quickly by following these suggestions. First, Strength or Dexterity should be your highest ability score, followed by Intelligence, and then Constitution. Second, choose the Sage background. Third, pick two shortswords, the scale mail armor, the arcane focus, and the explorer's pack. As a Arcane Warrior you gain the following class features. Skills: Choose 2 from the following; Arcana, Athletics, History, Insight, Intimidation, Investigation, and Stealth. If you are using starting wealth, you have 4d4 x 10 gp in funds. As a practitioner of natural arcane magic, you draw power from a hidden source of magic within you. At 1st level, you know three cantrips of your choice from the wizard spell list. You learn additional wizard cantrips of your choice at higher levels, as shown in the Cantrips Known column of the Arcane Warrior table. The Arcane Warrior table shows how many spell slots you have to cast your spells of 1st level and higher. To cast one of these spells, you must expend a slot of the spell’s level or higher. You regain all expended spell slots when you finish a long rest. You know two 1st-level spells of your choice from the wizard spell list. The Spells Known column of the Arcane Warrior table shows when you learn more wizard spells of your choice. Each of these spells must be of a level for which you have spell slots, as shown on the table. For instance, when you reach 3rd level in this class, you can learn one new spell of 1st or 2nd level. Additionally, when you gain a level in this class, you can choose one of the wizard spells you know and replace it with another spell from the wizard spell list, which also must be of a level for which you have spell slots. Intelligence is your spellcasting ability for your wizard spells. The power of your spells comes from a well of magic within you. You use your Intelligence whenever a spell refers to your spellcasting ability. In addition, you use your Intelligence modifier when setting the saving throw DC for a wizard spell you cast and when making an attack roll with one. You can cast any wizard spell you know as a ritual if that spell has the ritual tag. You may adopt a particular style of fighting as your specialty. Choose one of the following options. You can't take a Fighting Style option more than once, even if you later get to choose again. Creatures provoke opportunity attacks from you even if they take the Disengage action before leaving your reach, and your base movement speed increases by 5 feet. Starting at 2nd level, you have a limited well of stamina that you can draw on to protect yourself from harm. On your turn, you can use a bonus action to gain hit points equal to 1d8 + half your arcane warrior level rounded down. Once you use this feature, you must finish a short or long rest before you can use it again. Beginning at 2nd level, you may choose a subclass to emulate your combat style of choice: Battlemage or Researcher, all detailed at the end of the class description. Your subclass choice grants you features at 2nd level and again at levels 7th, 13th, and 17th. Starting at 18th level, you become extremely hard to fight due to your uncanny stance. When a creature you can see or hear melee attacks you, you can use your reaction to make attacks from that creature roll with disadvantage when attacking you. If the creature misses an attack against you, in the same reaction you can counter attack, making one melee attack against that creature. You may use this feature a number of times equal to your proficiency bonus and regain all uses of this feature when you finish a long rest. Beginning at 20th level, whenever you take damage by a creature within 40 feet of you, you may cast a cantrip at the creature as a reaction. Battlemages use their speed and elusiveness in battle to boost their combat capabilities. They race around on the battlefield felling foes with both their might and magic. When you choose this subclass at 2nd level, you gain proficiency in one of the following skills of your choice: Acrobatics, Insight, or Stealth. Alternatively, you learn one language of your choice. Starting at 2nd level, you may take the Disengage action as a bonus action. You may also take the Dodge action as a bonus action, a number of times equal to your proficiency bonus. You regain all uses of this feature at the end of a long rest. Starting at 10th level, when you use your action to cast a cantrip or take the Dash action, you can make one weapon attack as a bonus action. By 10th level, you gain the ability to enchant your weapon attacks with the force of the elements. Your melee weapon attacks deal 1d8 additional fire, cold, or lightning damage. You may use a bonus action to change the damage type of this feature. Starting at 14th level, when you make a melee attack against a creature, you don’t provoke opportunity attacks from that creature for the rest of the turn, whether you hit or not. Creatures also provoke opportunity attacks from you whenever they leave your reach, even if they have taken the Disengage action or use a form of magic. Researchers are usually the odd ones out of arcane warriors, as they don't really like to call themselves warriors. They specialize in modifying arcane magic to its upmost potential. When you choose this subclass at 2nd level, you gain proficiency in one of the following skills of your choice: Arcana, History, or Investigation. Alternatively, you learn one language of your choice. Starting at 2nd level, whenever you cast a spell that consumes a spell slot, you gain temporary hit points equal to the spell slot level. Starting at 2nd level, your ability to quickly assess tactical situations allows you to act quickly in battle. You gain a bonus to your initiative rolls equal to your Intelligence modifier(minimum 1). Starting at 10th level, when you cast a cantrip or spell that deals damage and roll a 1 on a damage roll, you may reroll the die. You must then use the new roll. Beginning at 10th level, when you make an ability check, an attack roll or a saving throw and have disadvantage on the roll, you can cancel the disadvantage for that roll. Alternatievly, before you make an ability check, an attack or a saving throw, you may add your proficiency bonus to the roll regardless of whether you are proficiency in the check or not. You regain use of this feature after you finish a short or long rest. Beginning at 14th level, your mind has become quick and complicated compared to before you started your journey as a researcher. You are now considered proficient in Wisdom saving throws and have advantage on saving throws against being charmed. Prerequisites. To qualify for multiclassing into the arcane warrior class, you must meet these prerequisites: 13 Intelligence and 13 Strength or 13 Dexterity. Proficiencies. When you multiclass into the arcane warrior class, you gain the following proficiencies: martial melee weapons and medium armor.